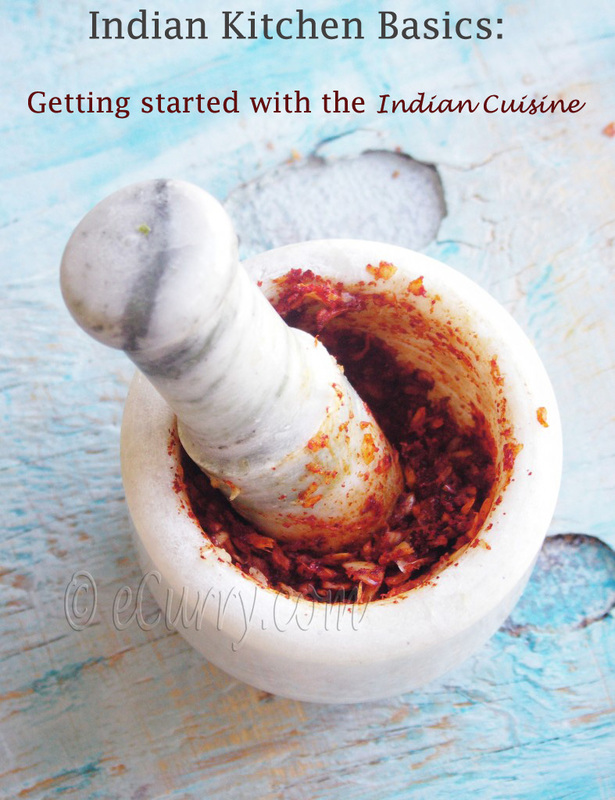 This is probably the one of the very few recipes out of five hundred and more in the blog that I will have posted after making it only for the very first time. But the assuring news is that this recipe will be repeated for years to come. There is always a first time. A new start. An experiment to begin with. And a pretty good hunch that the endeavor will not fail. It did not. Halwas do not fail. 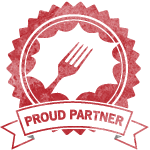 They are one of those forgiving kind of dishes and will allow you to play with the ingredients, open to changes. Winter times show in different colors in India. All of a sudden there is a burst of hues and flavors that come in with the crisp, cold air. 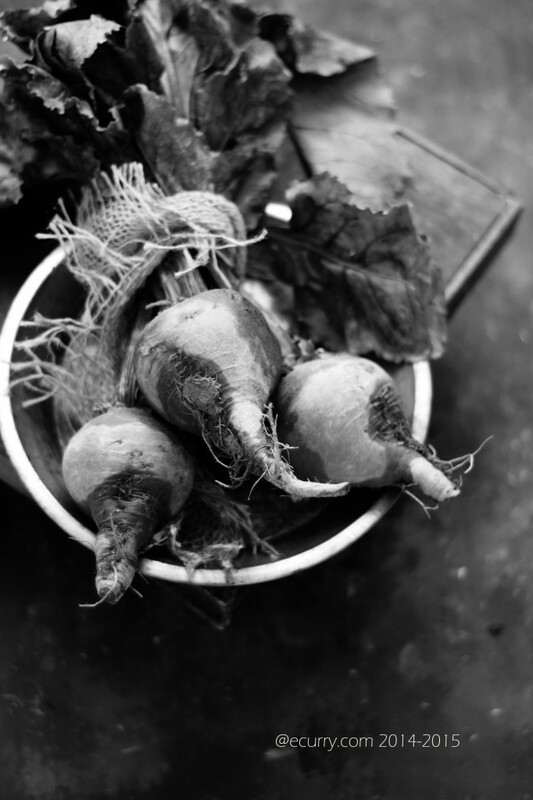 Carrots that are fat and red, cauliflowers, sweet peas in their pods, new potatoes, tender spinach with their stems tinged pink, sweet potatoes and beetroot with the fresh green leaves lined with vibrant red veins flood the bazaars. This used to be my favorite time of the year to go vegetable shopping with my grandma. Open markets line the sides of the streets. Sellers bring in their fresh harvests. Vegetables that are still tinged with dirt get piled in groups that draw a rainbow picture. That speaks fresh to me. Not the spanking clean, glossy vegetables that showcase the shelves of an air conditioned grocery store. From miles away, I can still close my eyes and smell that air. The farmers market here reminds me of home. The sellers take pride, in what they have nurtured. We bring back what have been grown with love and care. In the northern regions of India, winters are marked with making of halwas. There are different kinds; grains and seasonal fresh produce make the base. 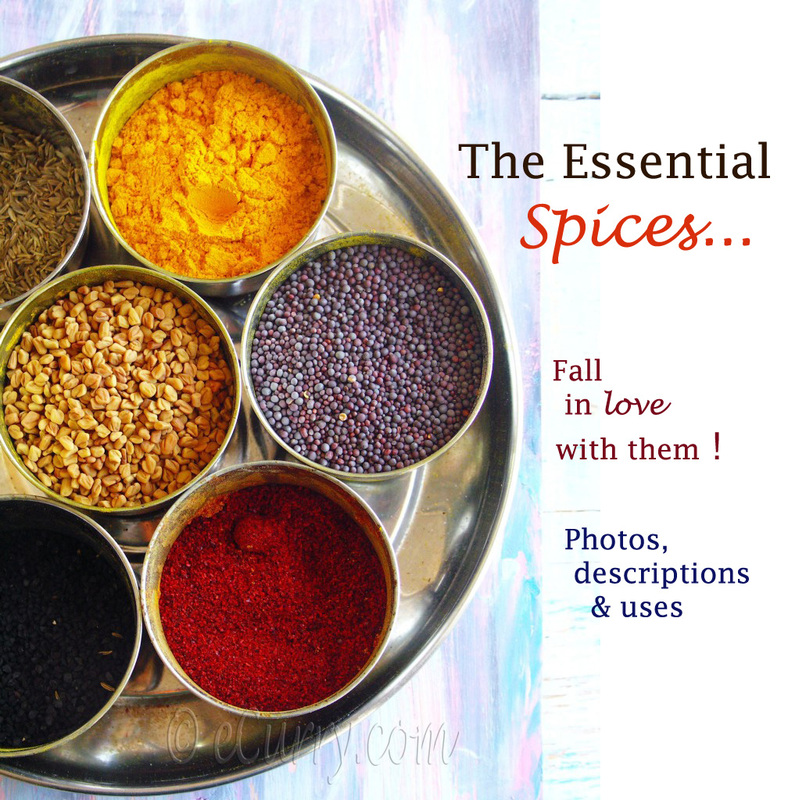 They are redolent of ghee, cardamom and nuts. What makes them perfect are the hours of simmering over slow fire, continuous stirring and sincere warm hearts. 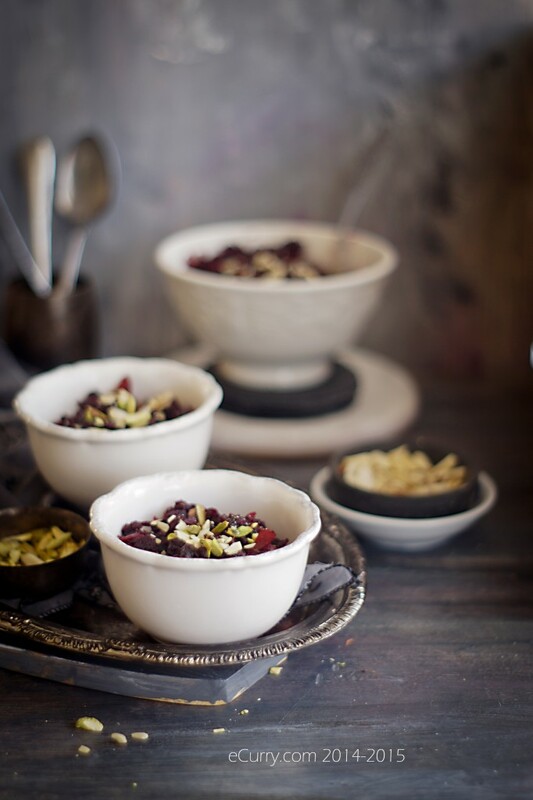 While carrot halwa was a must during the winter months, my maa never made halwa with beet. 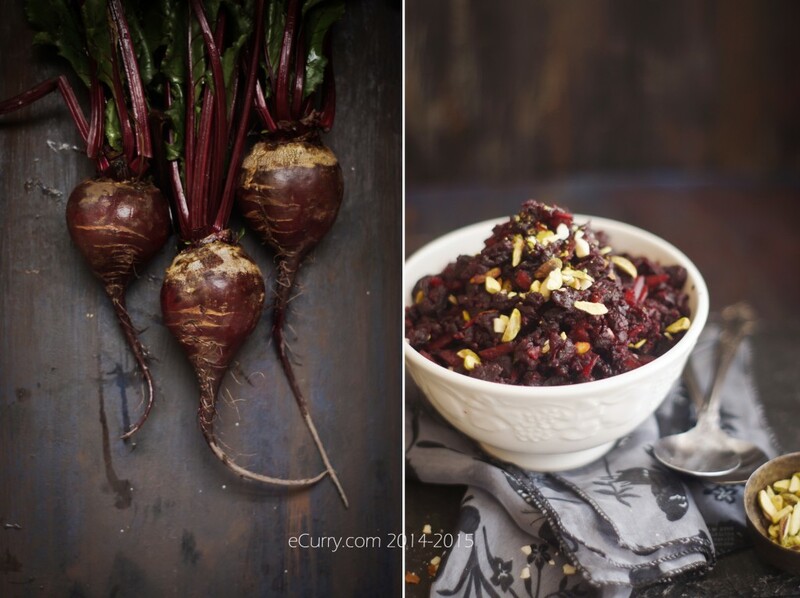 I loved beetroot just steamed or simply seasoned and always had it that way. 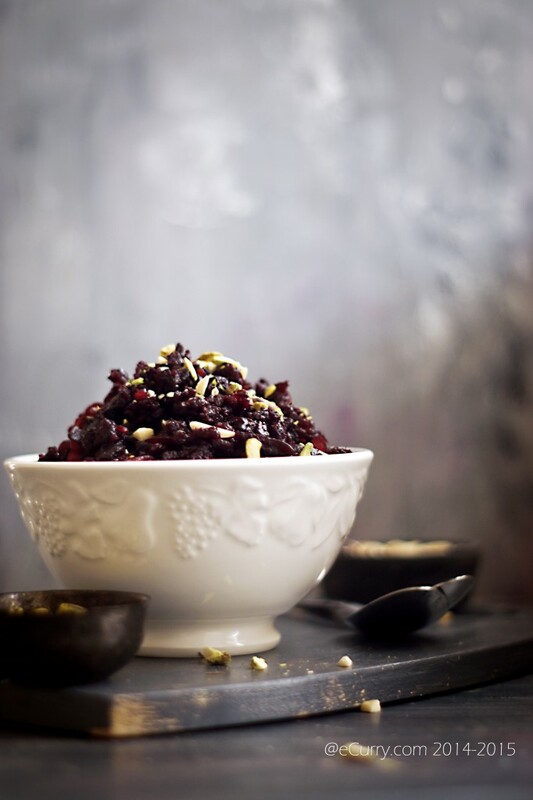 Halwa is nothing but a sweet confection made with fruits, vegetables or grains and flours. 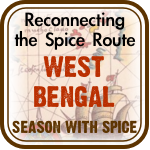 Different regions in India and even different homes in the same region have their own way to make halwa. My aunt made carrot halwa very differently from how maa made it. While ours was creamy and tender, my aunt had hers more candy like and glazed. It was sticky and sweet and lighter as it had almost no milk or cream in it. The texture was coarse and chewy than my maa’s halwa. I had the opportunity to have the best of both worlds. With the beetroot this time, I wanted a sort of chunky, candy like feel to the halwa. If you wish to make halwa with a creamy texture, you will need to add more milk/cream and cook it longer. The recipe is just a framework. 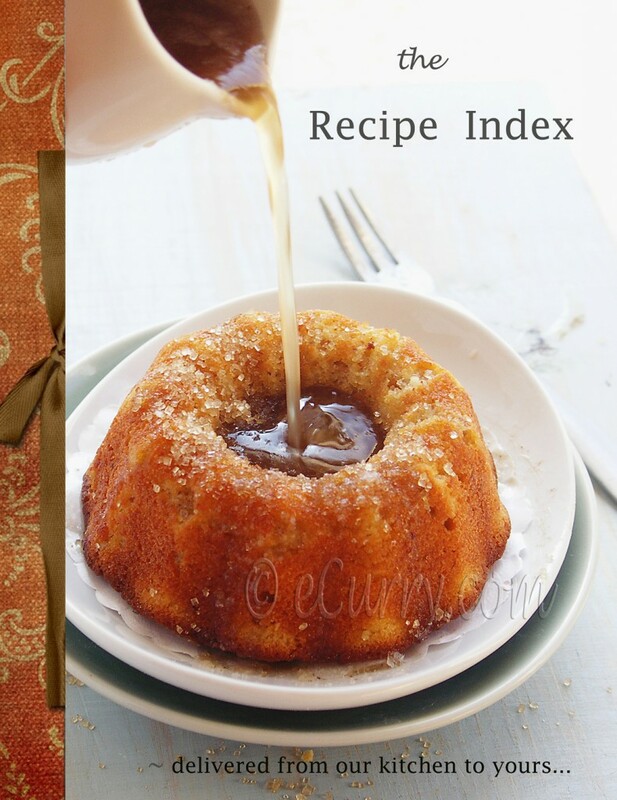 The amount of dairy, nuts and sweetener all depends on how you want your confection to be. 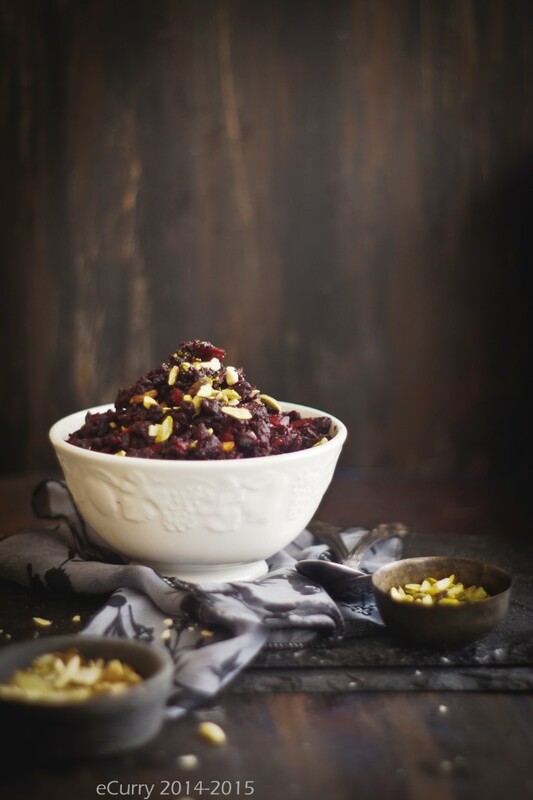 So if you are to make yourself some Beetroot Halwa, use this recipe to follow the basic process, but adjust your ingredients to your intuition. Make it your own! *Note: You may add more milk or cream to have a really creamy texture. If you do, you will have to adjust cooking time. The kind of halwa I have made here is lighter and less creamy. Adding more milk will make the halwa a shade lighter in color and also the consistency will change. 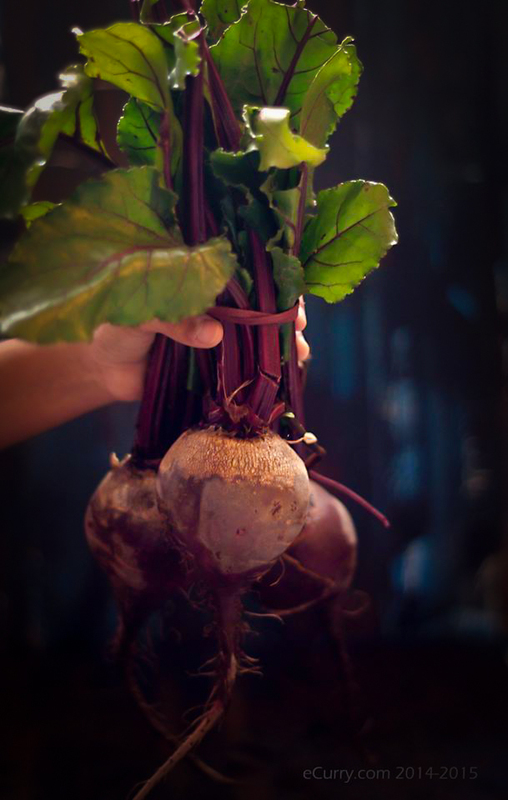 Steam or roast the beets until they become tender enough to be easily pierced with a fork. Cool and peel the beets. 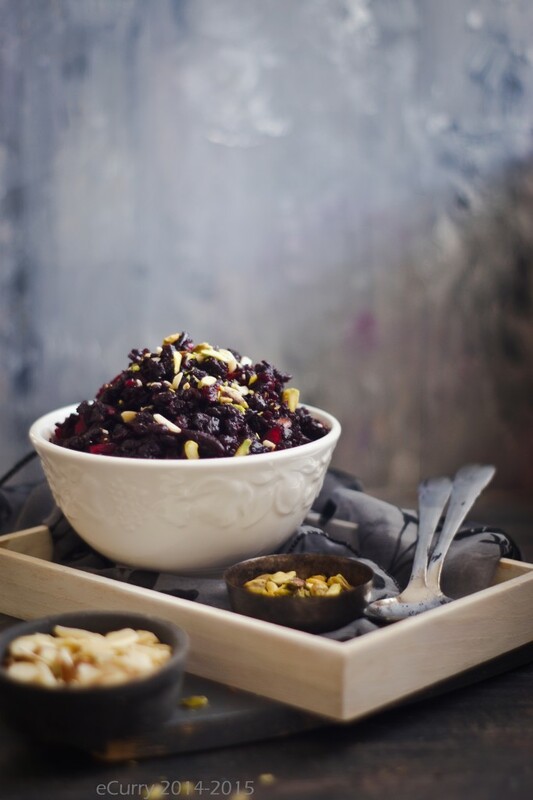 Now if you want a smooth texture for your halwa, you may grate the cooked beets. If you want a coarse texture with a slight bite, chop them in small pieces. 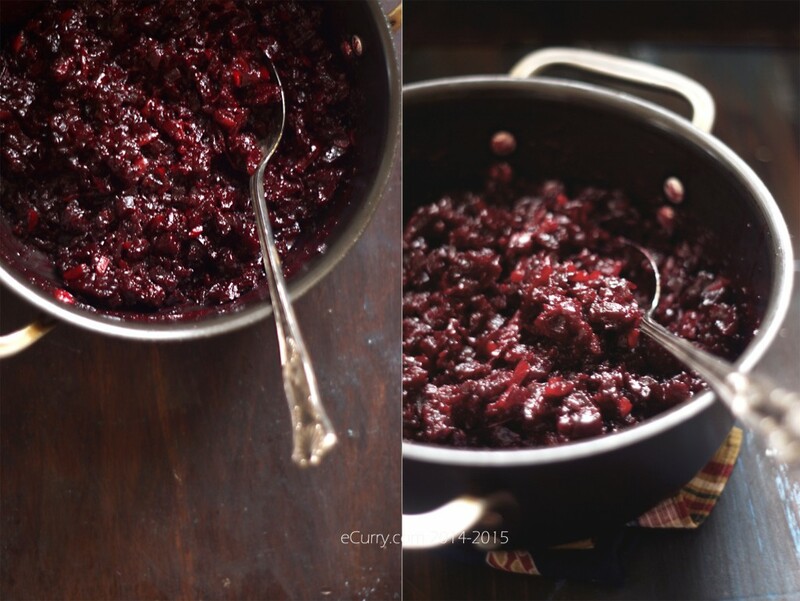 Heat ghee in a heavy bottomed pan; add the cardamom flour and the grated/chopped beet root. 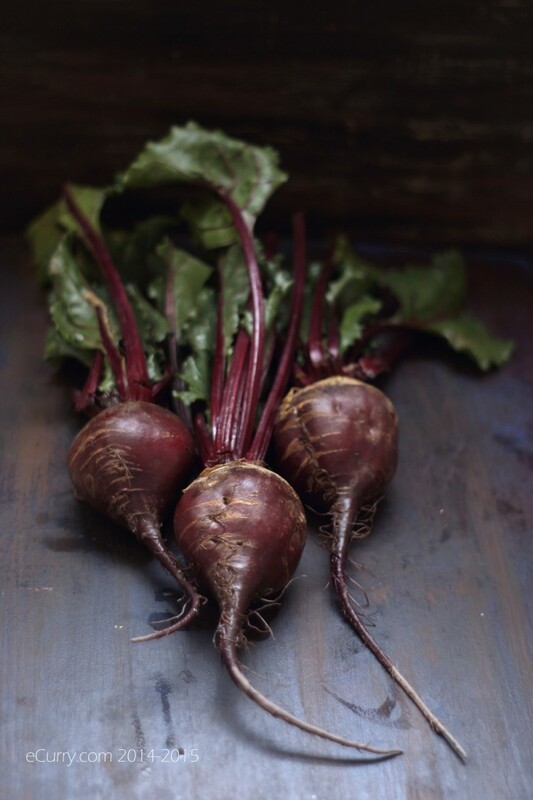 Toss frequently and cook over medium heat for about 10 minutes, until beet pieces are coated with the ghee. The beet will get glossy. Sautéing the beet long enough will make it lose its earthy flavor. The earthy flavor is not wanted in the dessert. Now add the milk/almond milk/water. Stir everything together, lower the heat, partially cover the pan and cook while stirring frequently to prevent the beet from sticking to the pan. While the halwa is cooking, you may add the sugar. Keep cooking. After about half an hour, start mashing the content in the pan with a potato masher. The beet would have softened some more and mashing them will give a somewhat smooth texture. After you are done mashing, add the nuts (lightly the toast the nuts if you wish) and cook for another thirty to forty five minutes. All the liquid would have been absorbed and the beet should have a glossy look and the halwa will be kind of sticky. The earthy smell would have gone and the content in the pan will start to leave the sides of the pan. it is done. When you see all these happen kind of at the same time, you will know it is near to done. The halwa will harden a tiny bit more when cooled. 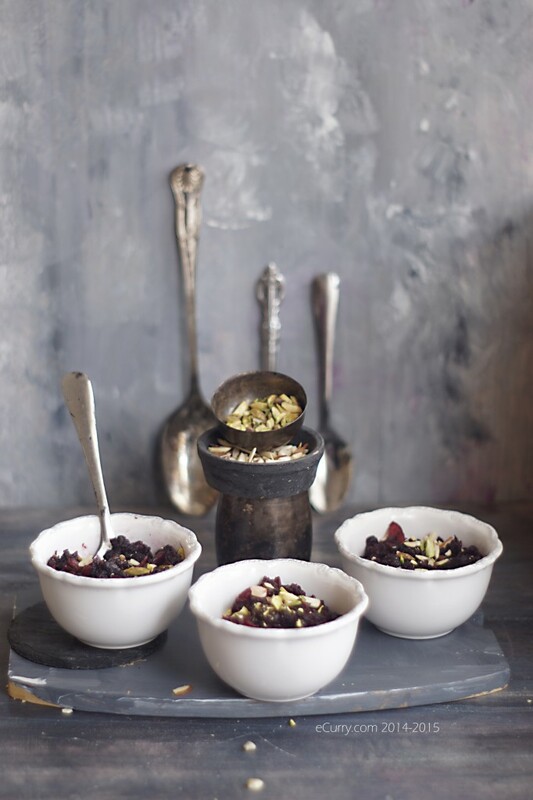 Serve warm, garnished with slivered/chopped pistachios and more nuts. (It can be refrigerated and then reheated before serving). Very original! 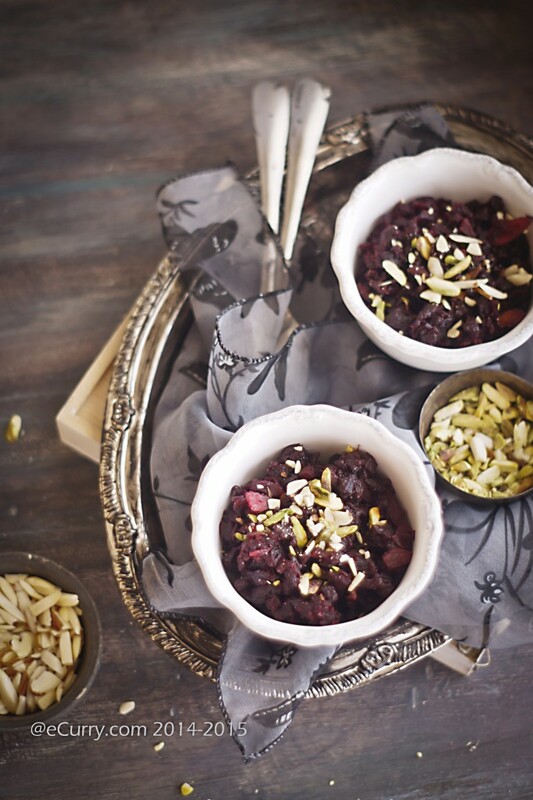 The beetroot halwa looks mighty delicious. It looks delicious – really unique and interesting and the photos are GORGEOUS. I especially like the 3rd, 5th, and second to last ones. 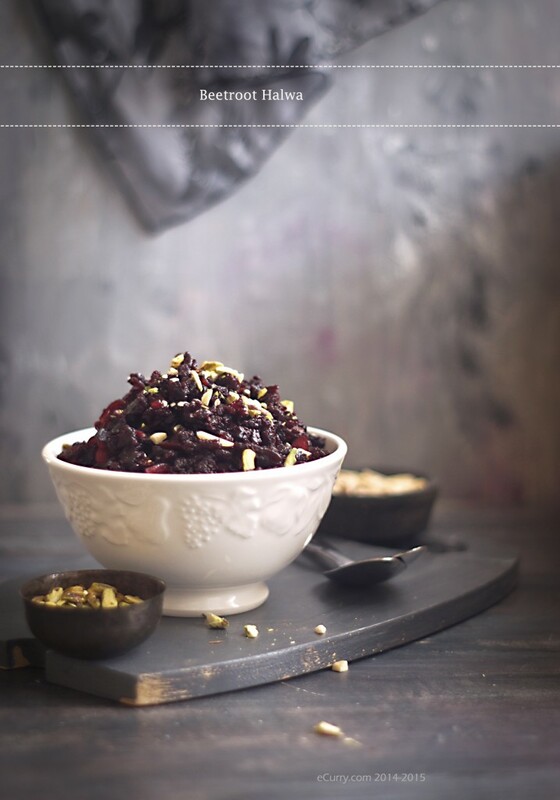 Your beetroot halwa reminded me of my aunt’s halwa that she used to make. I still remember the delicious taste. Don’t think she used any milk in it. As you say, halwas are versatile. Irresistible! Gorgeous. Love that rich burgundy colour. Must taste heavenly. I’m putting this on my to-do for the w/end! 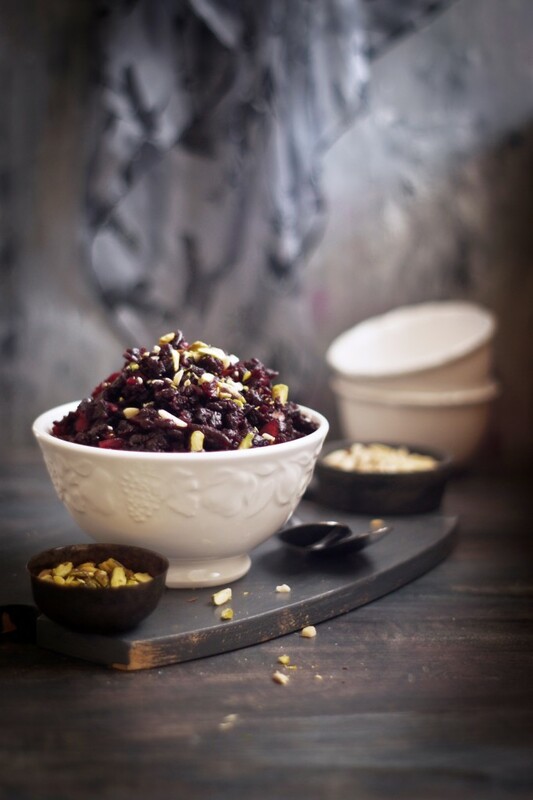 Beetroot halwa, wow! A few weeks ago, I made carrot Halwa for the first time after reading about it on a food blog and I absolutely love it! I can’t wait to experiment with beets. Thanx for sharing! My friend and I have been discussing personal blogs and online journaling. She feels that personal emotions and such must not expressed in such open forums. I realize no problem with it. Reveal your thoughts:. 1 . Do you blog or journal?. two. Do you like face to face manifestation of emotions over created communication?.